When I started my blog, I was just writing about animal things. Once I started typing, though, I blurted out everything that went through my head. Insert your comments here, I’ll wait. Now that this time of year has come around, I feel I need to be sure to get the word out about baby animals. Just a quick, factual blurb. Fawns are born at the end of May. It used to be after Memorial Day, but it seems to be earlier and earlier every year. Today I had my 5th well meaning call on fawns. 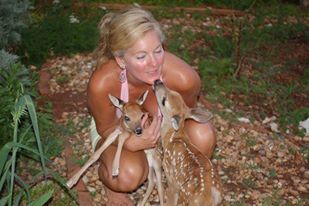 Fawns, my most beloved animal on earth. They cause me so much anguish that I’m walking around snapping at everyone because I’m worried about the last two calls I received. Me: This is Elexis Hays. Are you calling about an animal? Caller: Yes…silence…I got your number from…let’s see…. Me: Arrrgghhhh!!!!! What do you have? 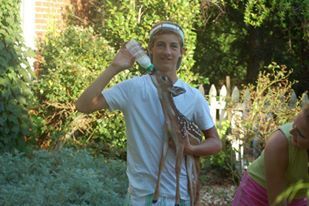 Caller: I have an abandoned fawn. Me: (Silently swearing) Where did you find it? Caller: The mom abandoned it in my yard, (woods, near a playground, school, church, wherever). 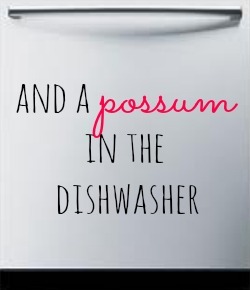 Then I have to go through the entire conversation that tells them that they have, essentially, kidnapped the fawn and the mother is in turmoil and the baby will never be just right, even though I am a fantastic fawn mom if I do say so myself. Here are the facts. Mother deer usually have two babies. Sometimes they have three, first time moms have one. They separate the babies and hide them somewhere where they believe they’ll be safe. They are thinking like a deer, not understanding where your property lines lay. They don’t care that you live on a golf course or that you live in a trailer. No, they don’t know that they are causing your poodle to bark inside the house. They aren’t interested in how much you paid for your pansies. They are not aware of the Atlanta city limits. 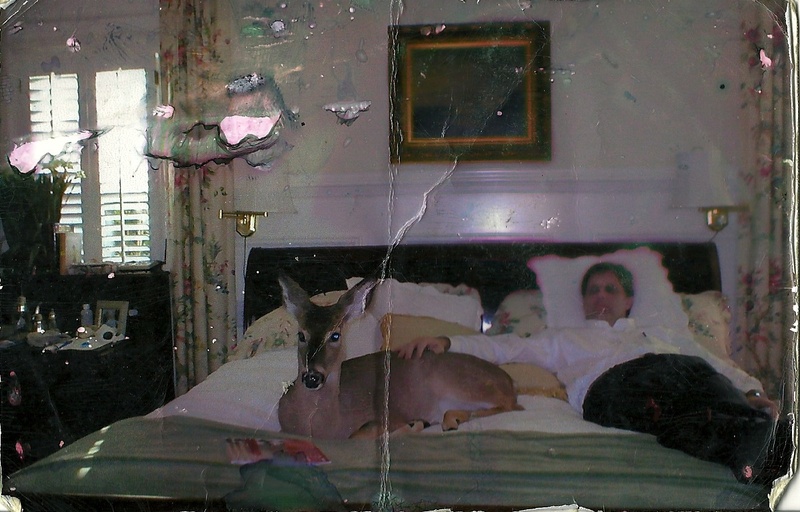 (Last year, someone called from inside Atlanta and DEMANDED that I come remove a deer from her yard because she lived INSIDE THE CITY LIMITS.) Sometimes, it doesn’t make sense to anyone except the mom. Babies are left to themselves ALL DAY. Moms hide them at dawn and come back at dusk. Sometimes, she’ll pick the same spot several days in a row. Your coiled up hose may look like Moses’ basket to her. Under your trampoline might look shady and inviting. 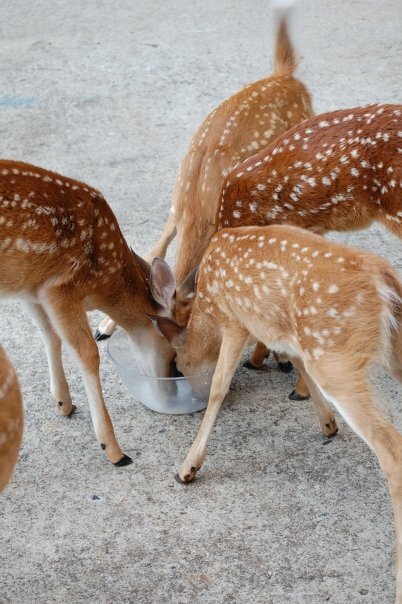 Fawns have very little odor. If the mother were to be pursued by a predator, she can most likely out run it, but not with babies tagging along. Hidden, the babies lie very quietly all day and in this way, they are kept safe from evildoers. Their camouflage is so perfect that I have searched for one, lying just where I left him, and not even seen him. I can yell and scream for him and when my eyes finally focus on him he’ll be blinking his long eyelashes and looking at me as if to say, “Yes? And you are hollering because…?”. Imagine if you put your baby to bed and came back to find her gone? It makes me so sad when I’m feeding a newbie and imagining the mother searching for days. It’s basically the same with rabbits. Just because you don’t see the mother come back, don’t worry. Rabbits are shifty. They’re sneaky. If you disturb a nest, build it back as best you can, replace the babies and check on them daily to make sure they’re not dying of dehydration. If they their skin snaps back when you do the “pinch” test, no worries. The mom is sneaking back, just like nature intended. I get lots of calls for birds, about which I know almost nothing. Mostly, though, they are fledglings. Several times I’ve written about fledglings. Baby birds don’t fly from the nest. 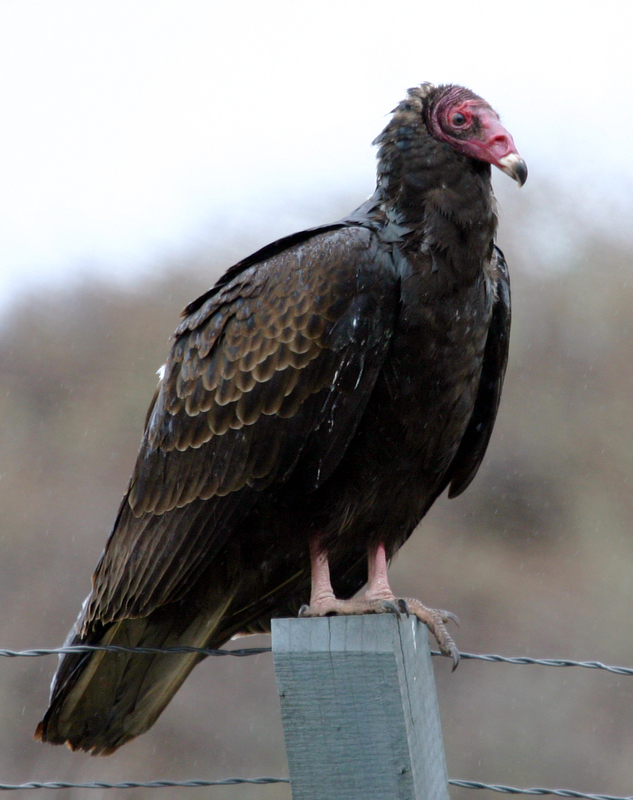 They live on the ground for several weeks while they get their big bird feathers and their parents teach them the ropes. Leave them alone and keep your cats inside if you can. If you see a mother deer that has been hit, look around for the baby. This is the situation I’m in today. It makes me sick, knowing that one or two little ones are out there and will starve to death. The caller, a caring individual, has assembled a team to search. Even though I’ve taken myself off the DNR list this summer due to travel, I have agreed to take this baby. I adore deer. They are smart, just like dogs. They play, they have personalities, they live in family groups and mothers and daughters can stay together for life. They harm no one. Deer hunting is wrong, no matter what anyone was raised to believe. It is a good wholesome tradition in the same way shooting someone’s dog is great family fun. Pass this along. I would say 90% of the babies I’ve raised have come from a kidnapping situation. Well meaning, but wrong, nonetheless. If people just knew babies are meant to be alone all day, they could enjoy the privilege of having a sweet little fawn in their yard for a day or two, maybe snap a couple of pictures and allow the little one to grow up wild, just like she’s supposed to. 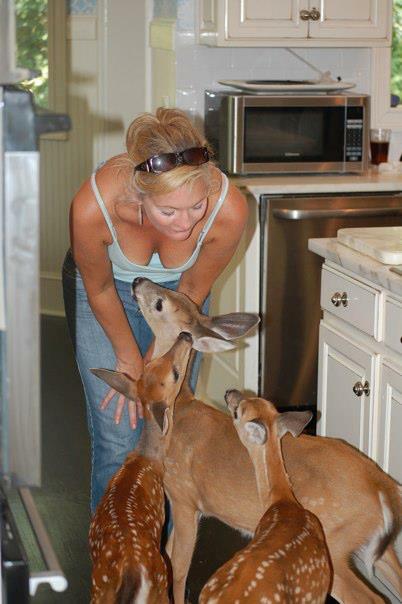 Although these pictures show cute little babies, deer are not pets. Of course, while they’re being fed and cleaned by me (and many times by my long suffering kids), they see me as mom. As they get a little older, they come off the bottle are are made to forage for themselves. By the time I release them, around Labor Day, they are independent little thinkers. I’m sure they wonder, now and then, when they’re out on their own, where their hairless ugly mother is, but my goal is always for them to live in the wild. 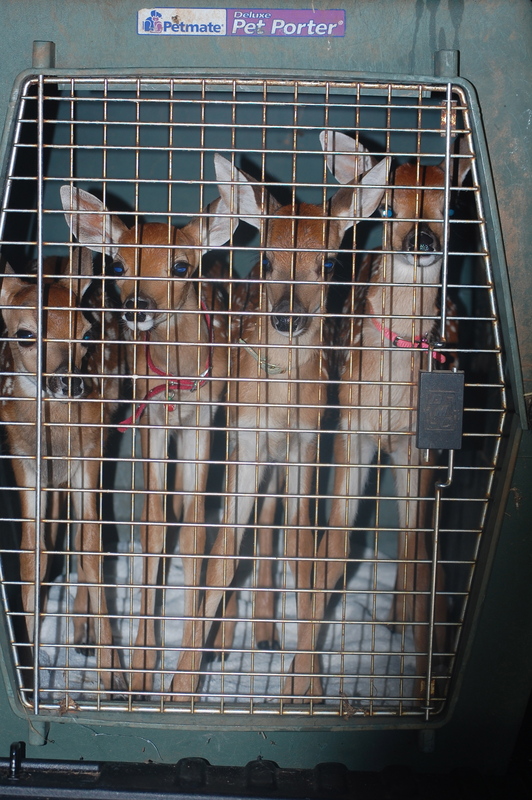 Deer that are raised in captivity until adulthood usually have to be destroyed because they become a danger to themselves and others. So please, just enjoy out your window! And that’s my friendly animal rant of the day.